Shay Landers was born in Yuba City, but raised in Henderson, Nevada. Landers is a grey-shirt this year for the Eagles, which means he is not a full-time student which saves his eligibility but can still practice. He graduated from Foothill High School in 2016, where he was a pitched and played third base in baseball and defensive end in football. Landers committed to College of Southern Nevada to play baseball for the Coyotes, right down the road from where he played in high school. Landers came to USUE after first semester after he red-shirted for a year at CSN. “I knew about USUE from being in the conference and my roommate Hunter Lasko was also transferring there.” He said he did not really enjoy his time at CSN, and felt he wanted to keep playing, just not there anymore. “Every player thought they were so good and felt they were going to get drafted, just because they were playing at CSN.” He felt as if everyone only played for themselves and didn’t care about the team. Unlike CSN, Landers likes the chemistry and relationships the players at Eastern have. It fit his style when he came up and played in a few practice games in the fall and knew this was the place he wanted to play at next. He says he has some great memories and friends, even after being here for such a short time. 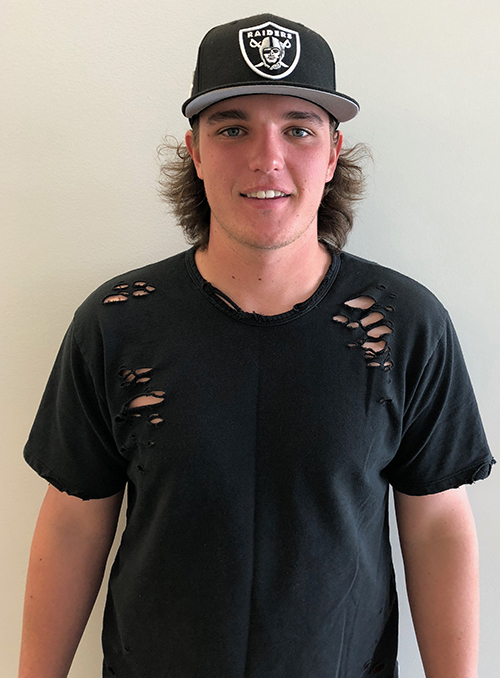 He says his favorite memory so far would be splitting the series with CSN, and ending their 22-game-wining streak as the #2 ranked team in the junior college standings. “ I[t] felt good to stick it to them because they’re just all so cocky and think they can’t be beat.” Landers is looking forward to the next two years he has playing baseball at USUE.